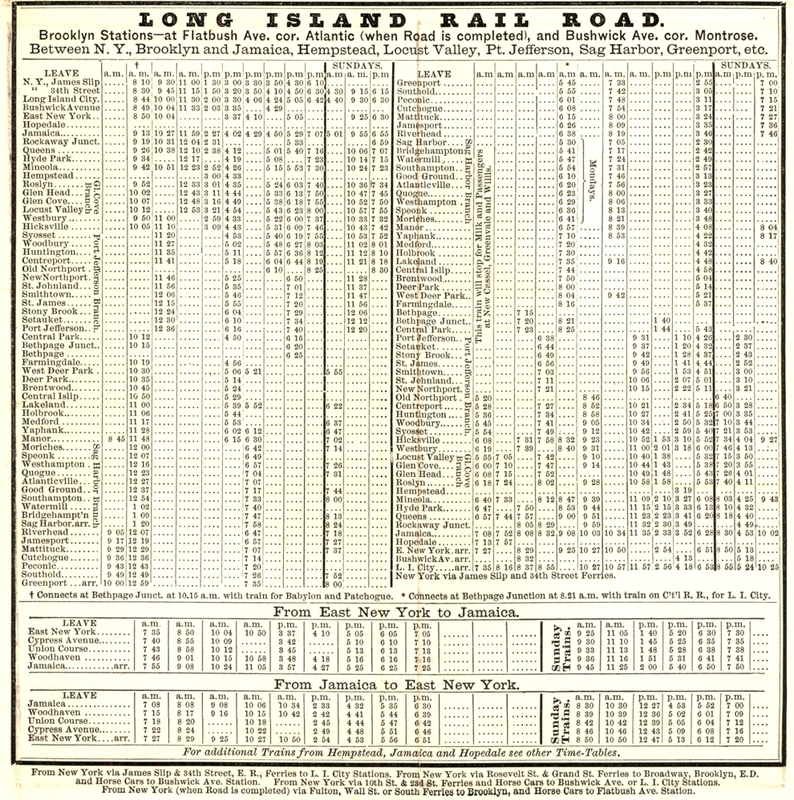 EXTENSION RAIL ROAD OPENED TO BABYLON VERY FEW C.R.R.L.I. 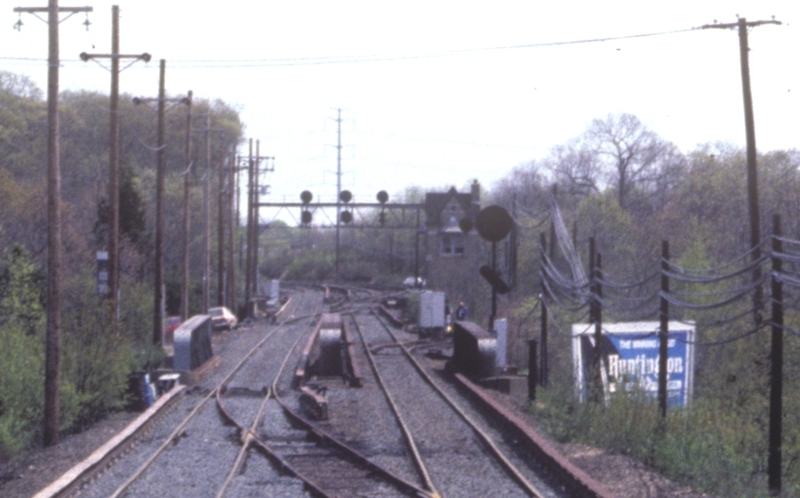 TRAINS STOPPED HERE. 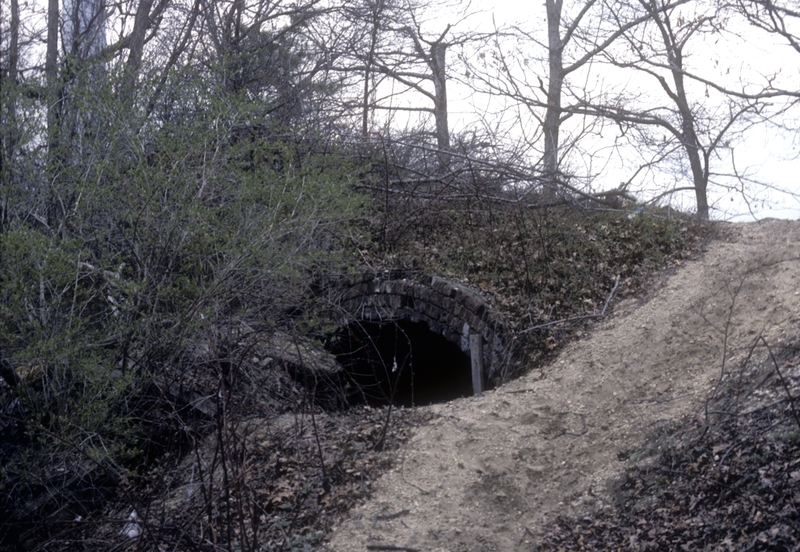 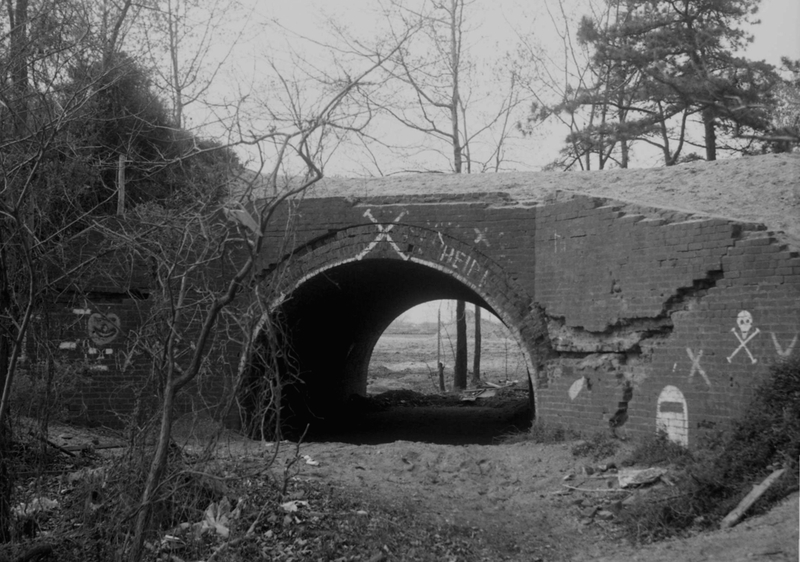 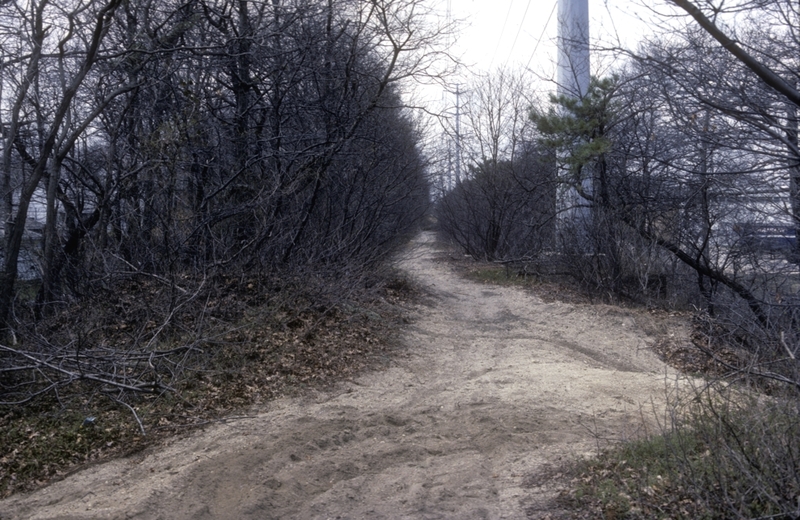 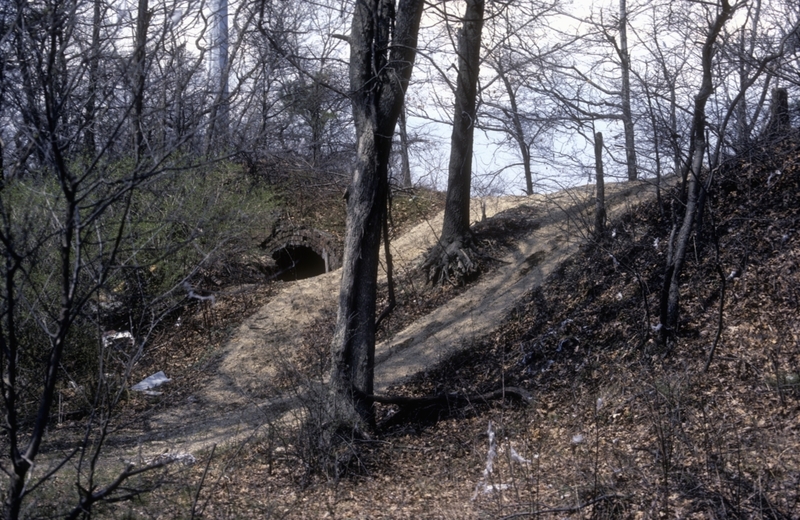 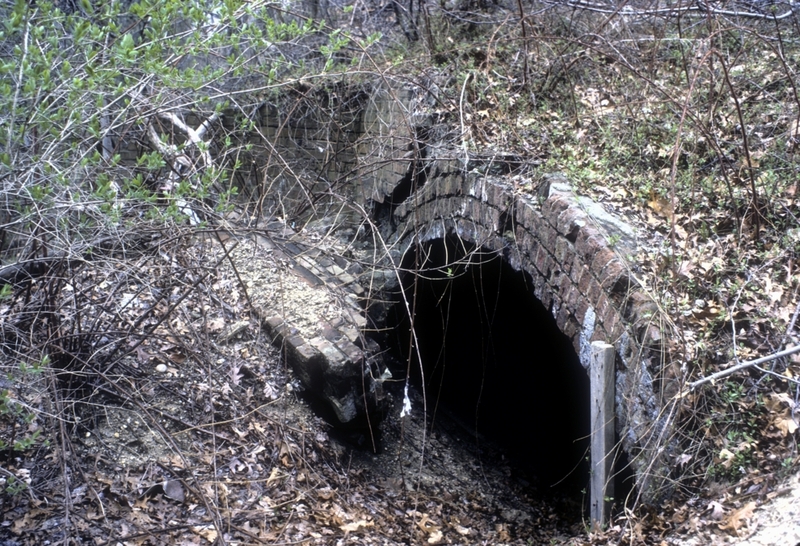 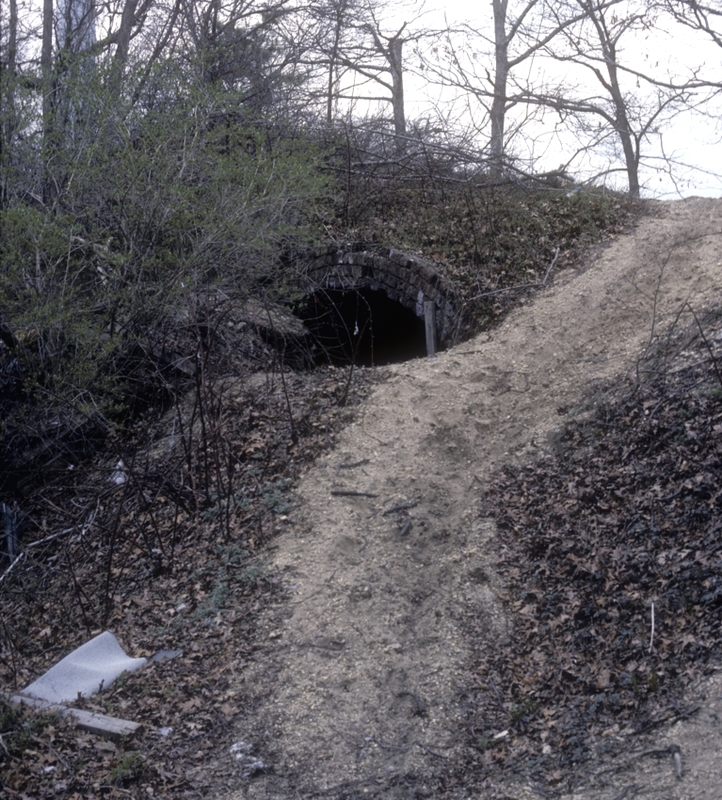 CULVERT ON THE CENTRAL JUST WEST OF BETHPAGE JUNCTION WAS PARTIALLY FILLED BUT STILL VISIBLE IN 1985. 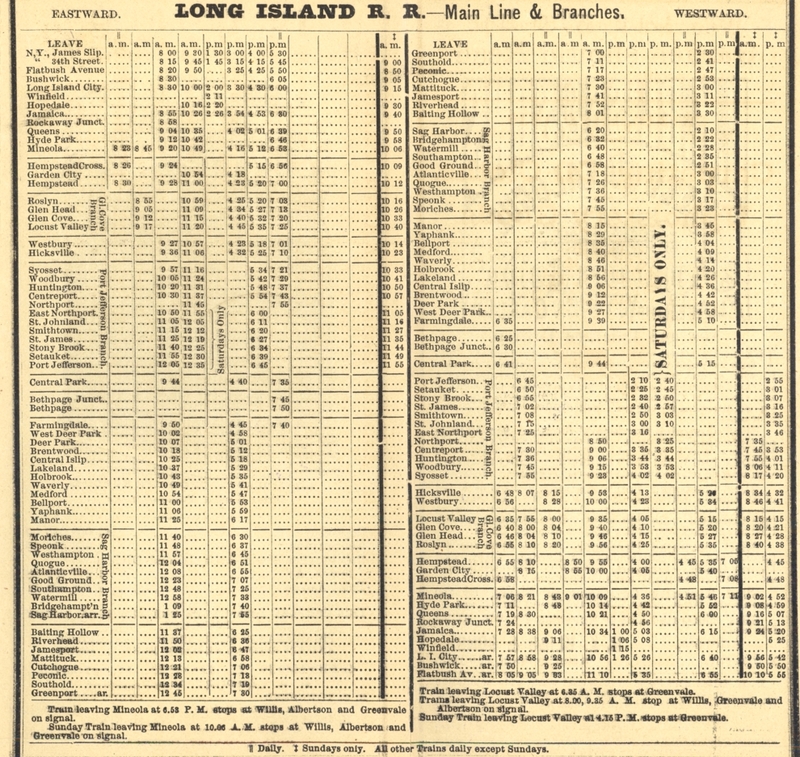 WITH GREENPORT TO EAST NEW YORK TRAINS VIA MAIN LINE. 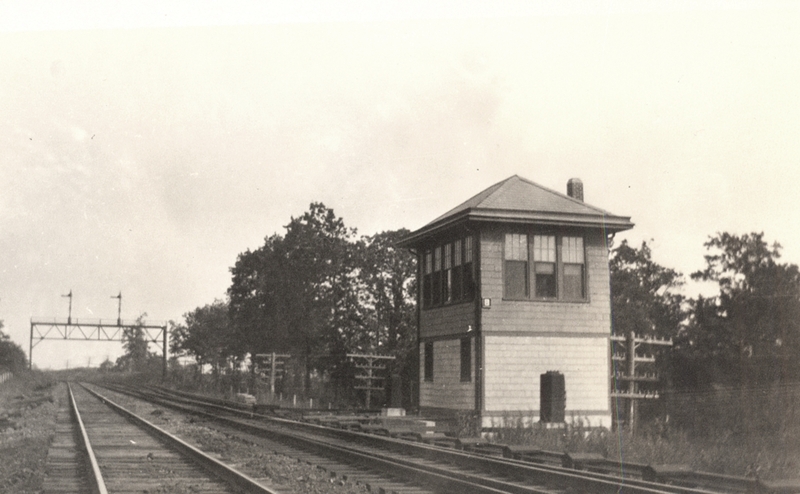 FARMINGDALE, WHICH REQUIRED A REVERSE MOVE AT BETHPAGE JUNCTION. 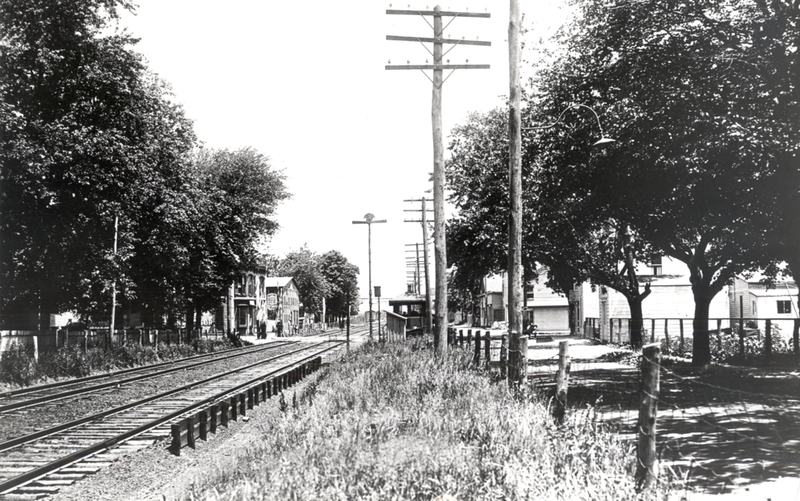 1900 FULLERTON PHOTO OF EASTWARD MAIN LINE TRAIN AT SWITCH TO CENTRAL EXTENSION. 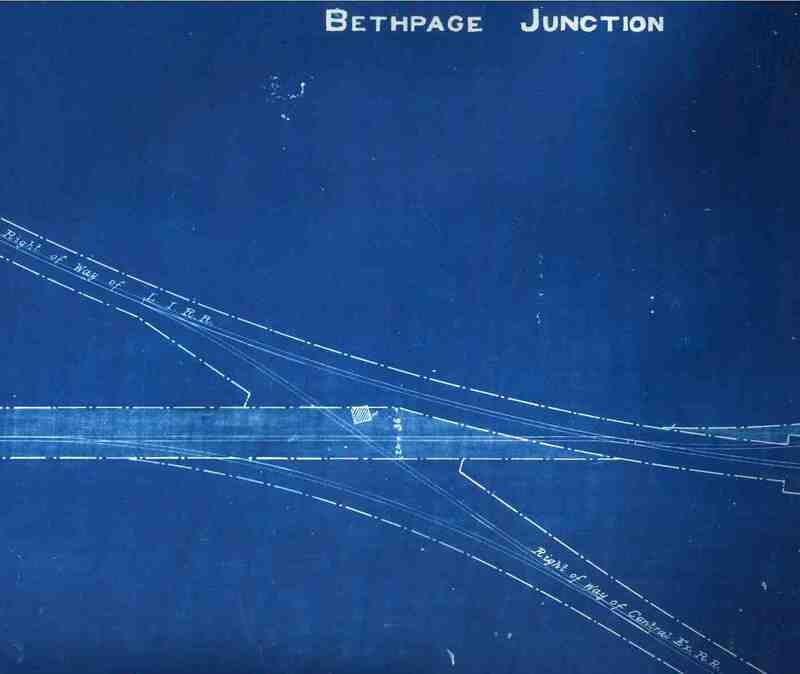 1892 BLUEPRINT OF BETHPAGE JUNCTION INTERLOCKING - TOWER NUMBER 49 INSTALLED AUGUST, 1885. 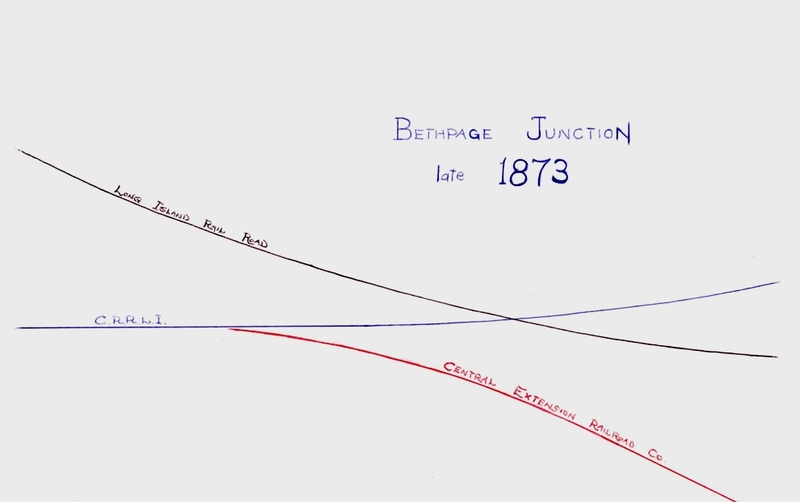 THE 1885 INTERLOCKING WAS REMOVED FROM SERVICE IN 1897 or 1898 AND THE CENTRAL EXTENSION, GARDEN CITY TO BELMONT JUNCTION, NO LONGER USED FOR REGULAR TRAINS. 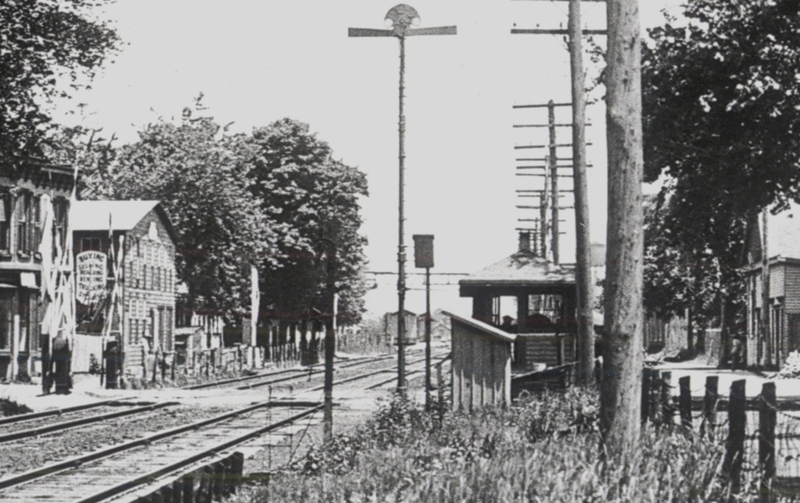 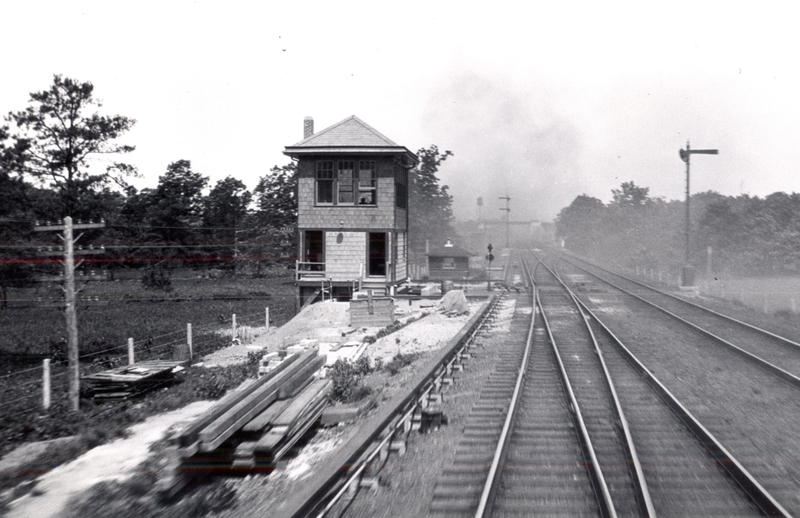 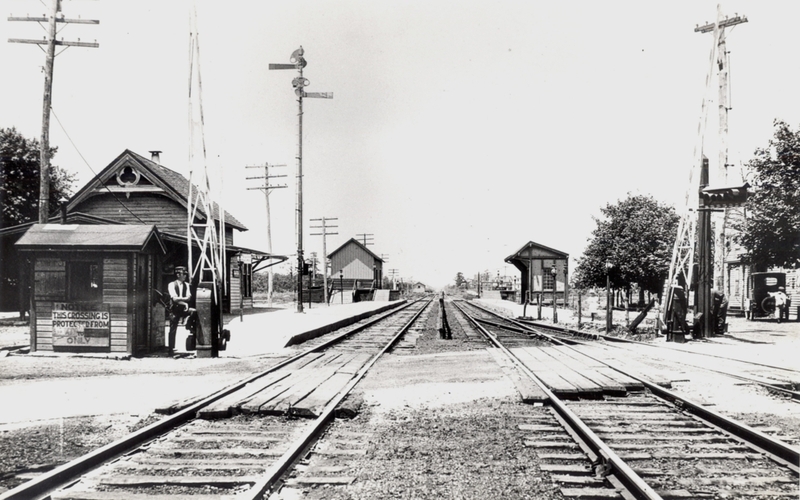 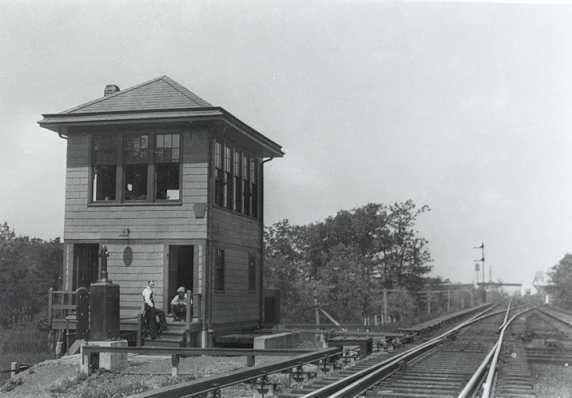 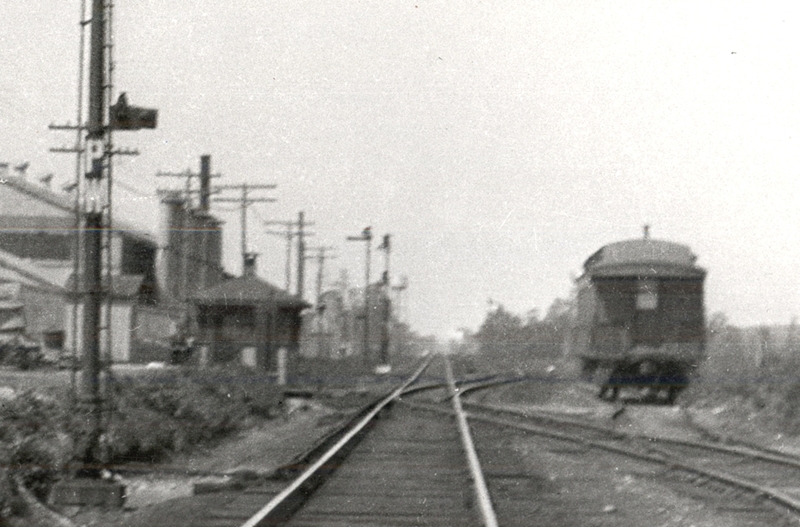 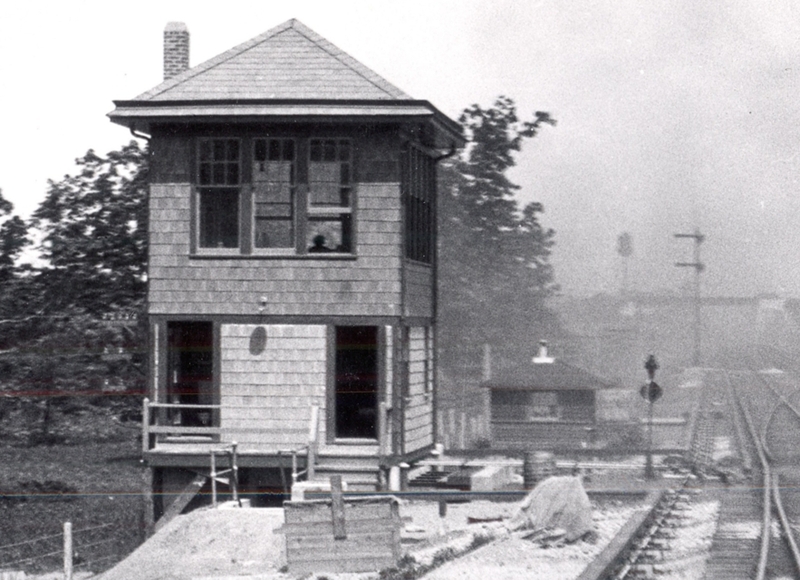 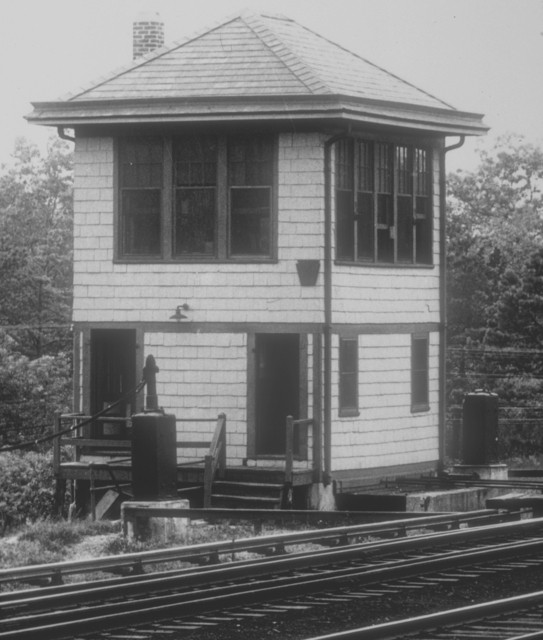 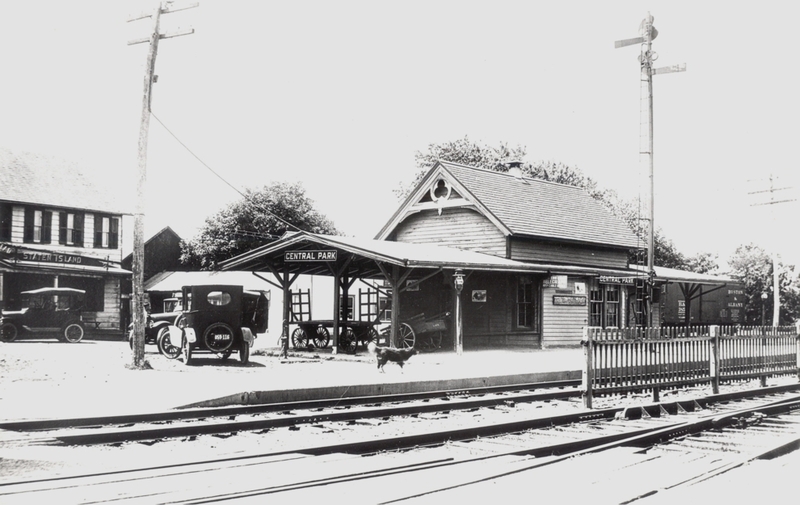 IN 1925 THE CENTRAL BRANCH WAS REBUILT BETHPAGE JUNCTION TO BELMONT JUNCTION AND THE SWITCHES WERE MOVED TO WEST OF THE CURVE AND OPERATED BY "BE" CABIN UNTIL "B" TOWER WAS COMPLETED. 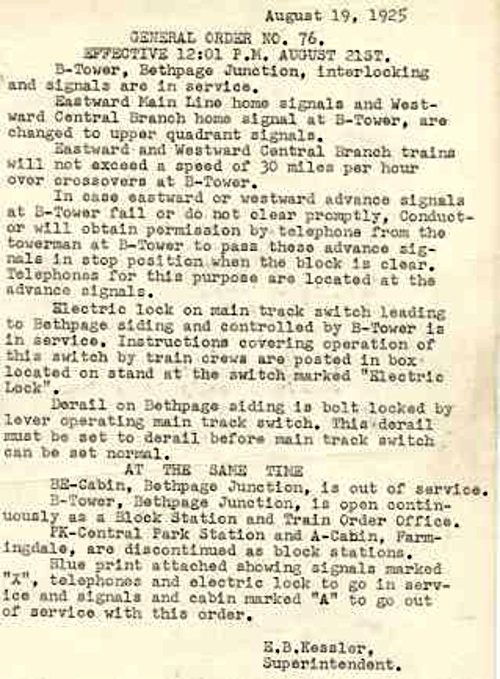 MANUAL BLOCK SIGNAL STATIONS WERE "HX" TOWER HICKSVILLE, "PK" AT CENTRAL PARK STATION, "BE", AND "A" CABIN WEST OF FARMINGDALE STATION. 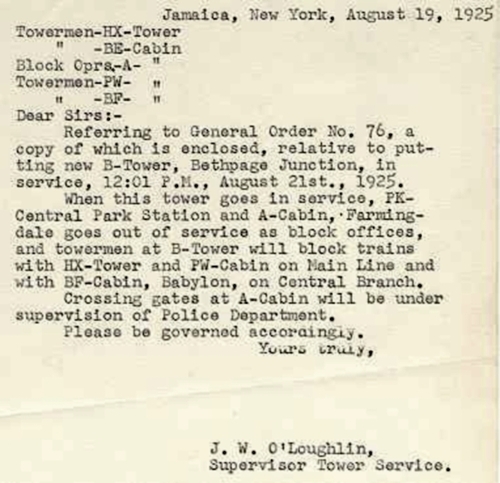 "B" TOWER NEARING COMPLETION IN 1925 - "BE" CABIN WEST OF TOWER. 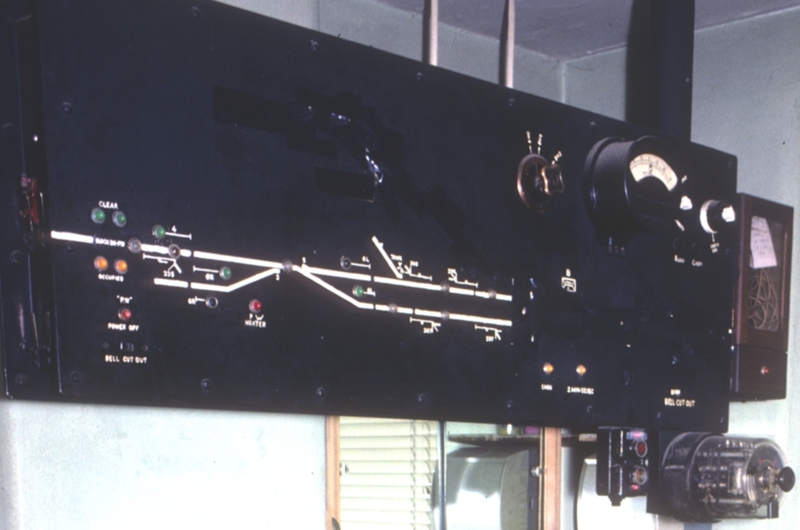 IN 1930 "PW" WAS MADE REMOTE CONTROLLED FROM "B". 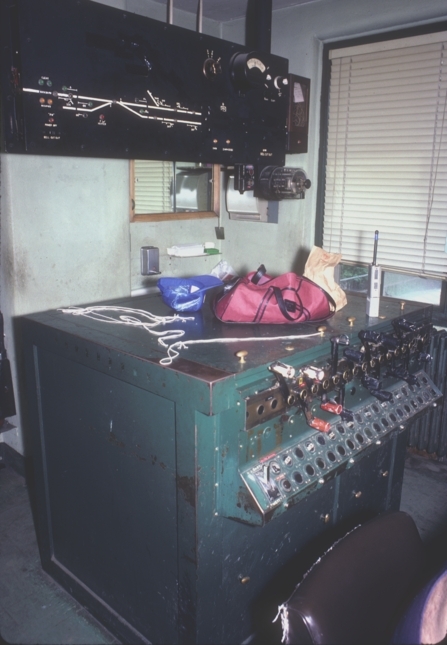 PHOTO SHOWS MACHINE IN "B" TOWER FOR OPERATING "PW". 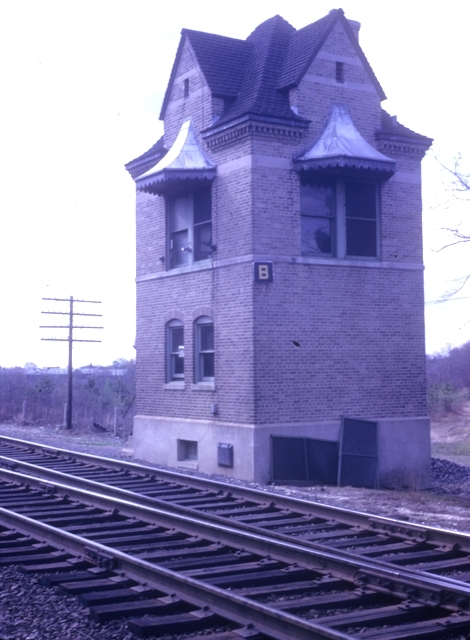 INTERLOCKING AND THE FRAME TOWER WAS REPLACED BY A NEW BRICK TOWER. 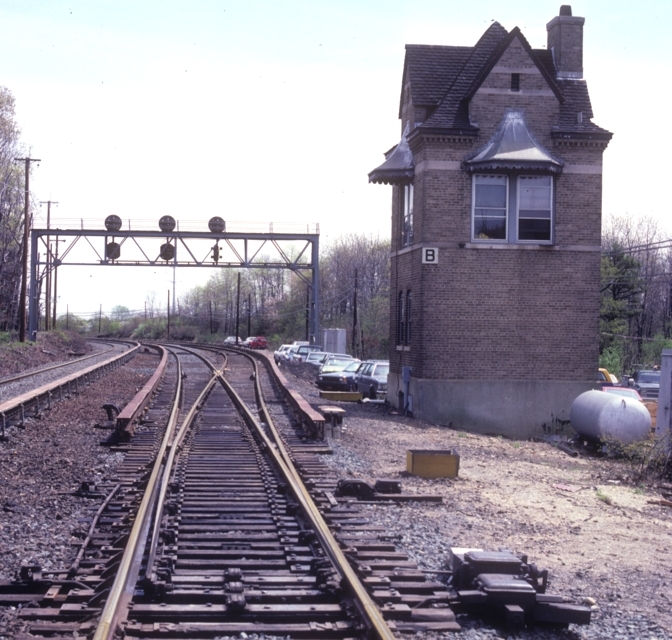 EXTERIOR ARE MAY 1963, INTERIOR JUNE 1987. 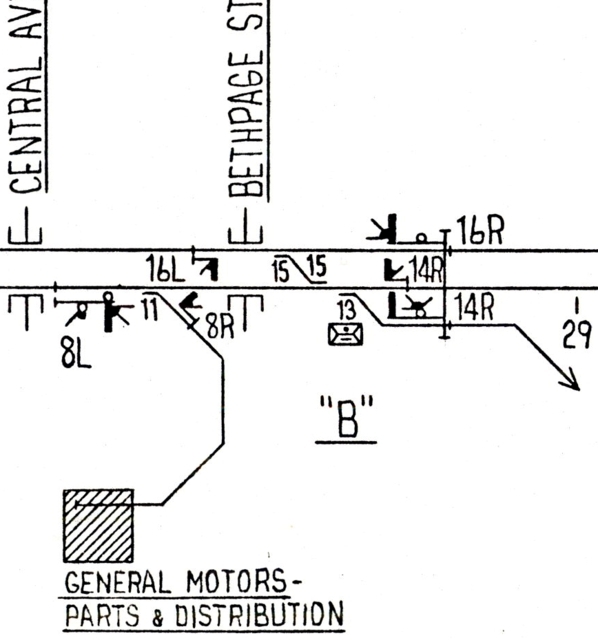 THIS IS THE WESTERN LIMIT OF "B" INTERLOCKING UNTIL JUNE 1965. 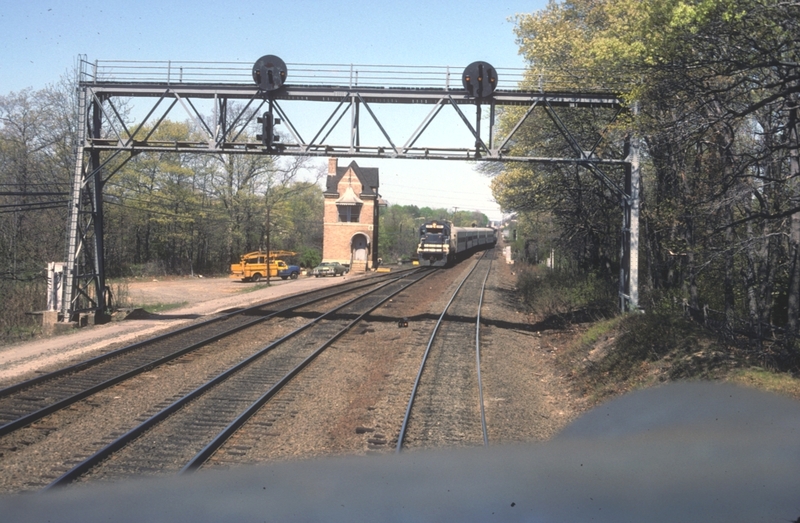 TRACK TO EASTBOUND TRACK - WESTWARD TRAIN WAITS AT STOP SIGNAL. 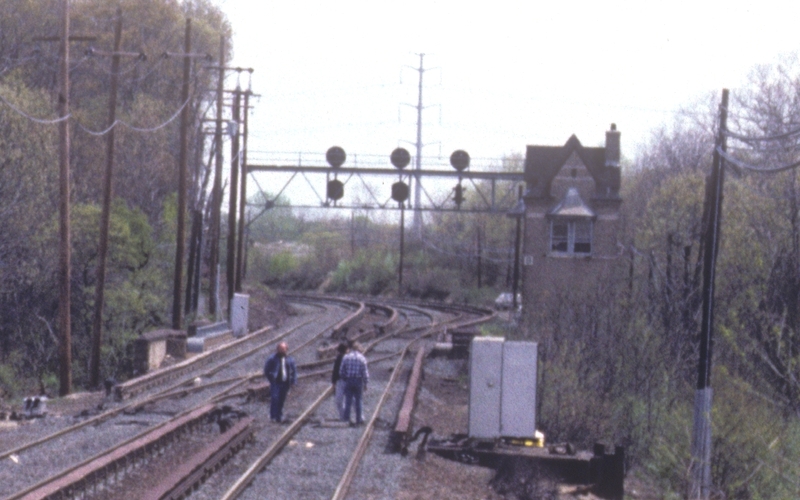 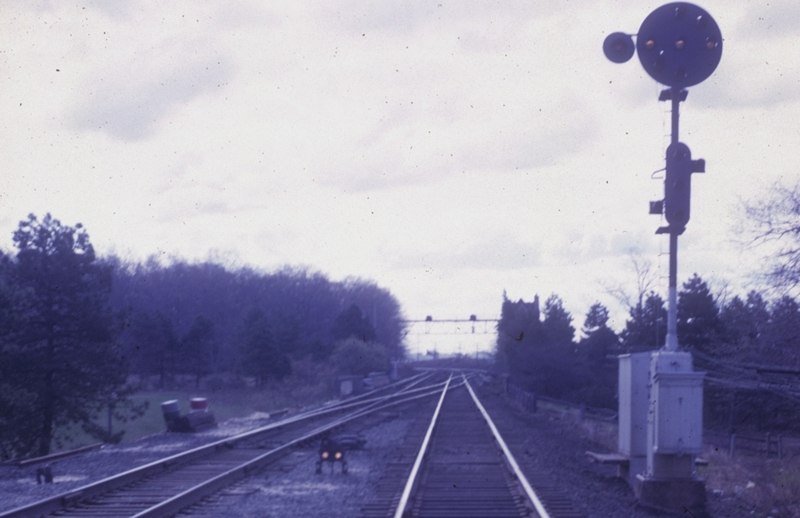 NUMBER 11, THE EASTBOUND HOME SIGNAL, NUMBER 8L, WAS MOVED WEST 385 FEET. 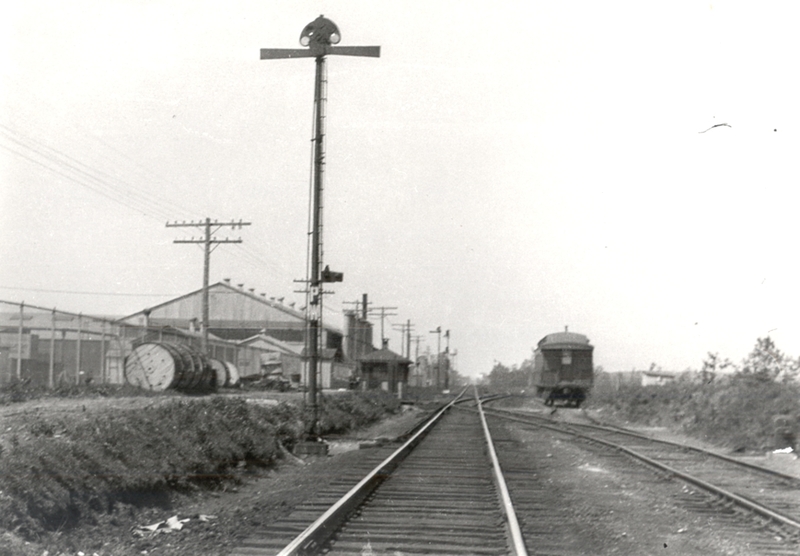 LOW HOME SIGNAL NUMBER 8R WAS INSTALLED GOVERNING MOVEMENTS FROM THE SIDING. 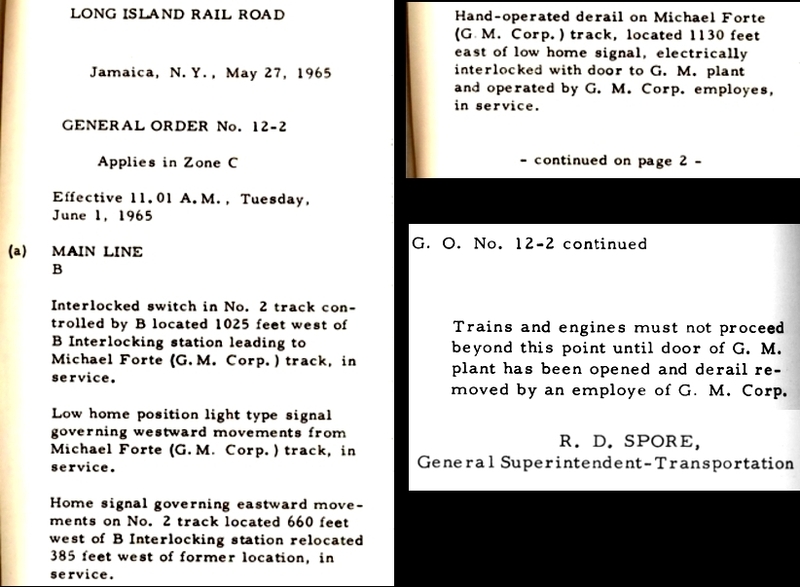 INTERLOCKED WITH THE DOOR AND OPERATED BY G. M. EMPLOYES. 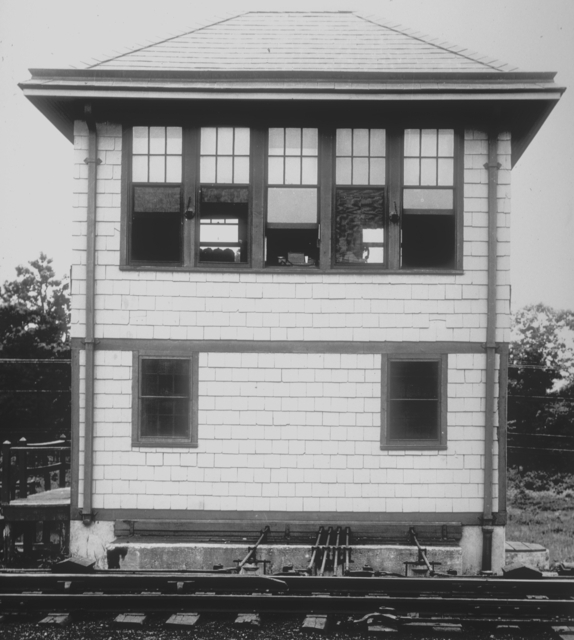 THE SIDING WAS NOT USED BY SLEEPY'S AND WAS REMOVED. 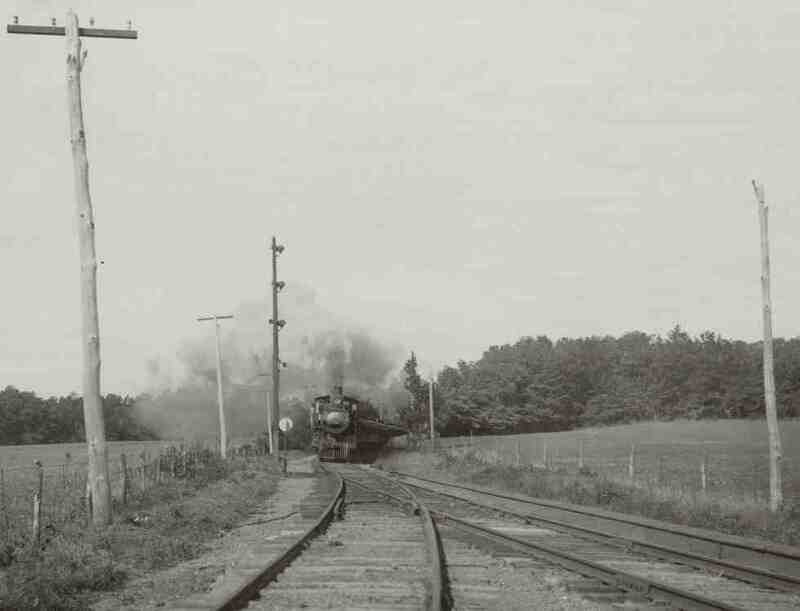 "and the siding switch is now gone. 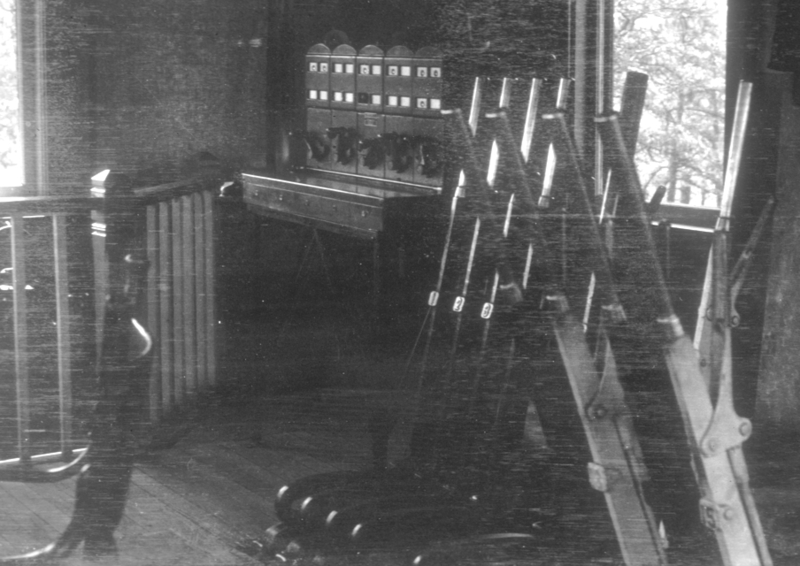 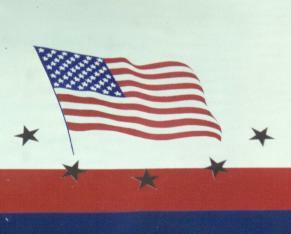 The facility moved to the Philadelphia area. 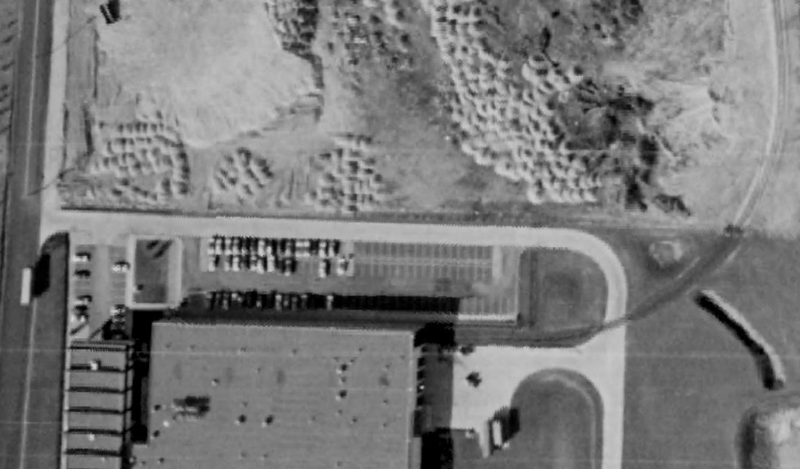 "GM used to take three to four cars a day, usually off the RF-11 in the wee hours." 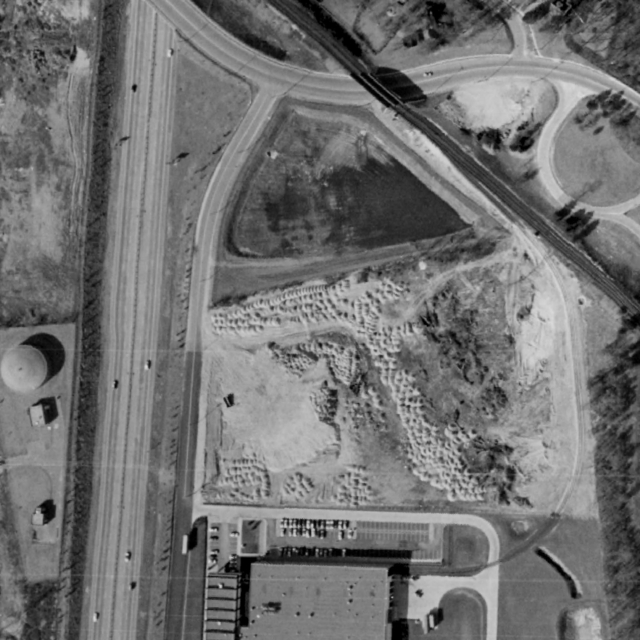 THE INTERLOCKING AND BY JUNE MOST OF THE INTERLOCKING WILL BE CONTROLLED FROM DIVIDE. 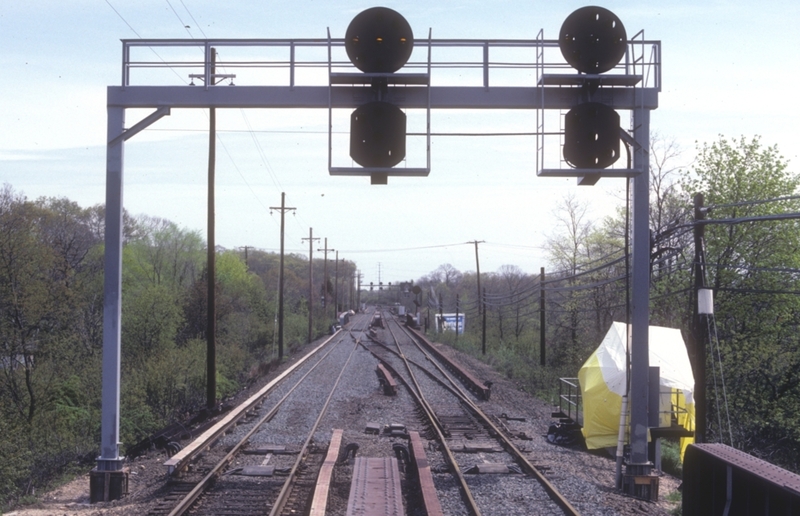 THE SWITCH TO THE CENTRAL BRANCH AND THE CROSSOVERS ARE NOW HIGH SPEED TURNOUTS. 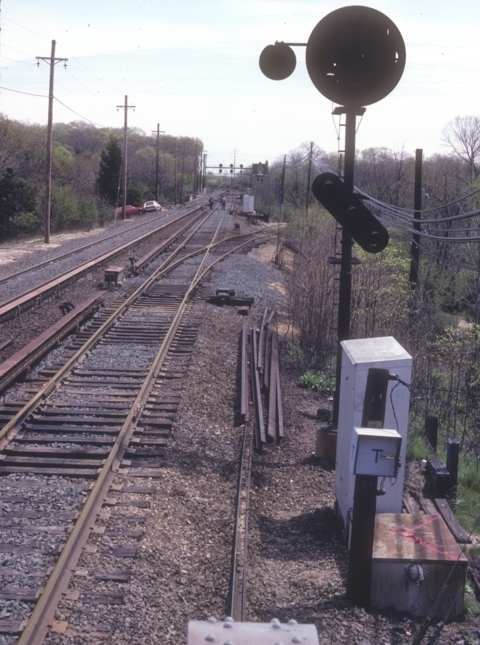 A FACING POINT CROSSOVER HAS BEEN INSTALLED AND THE HOME SIGNALS ARE NOW ON A NEW BRIDGE. 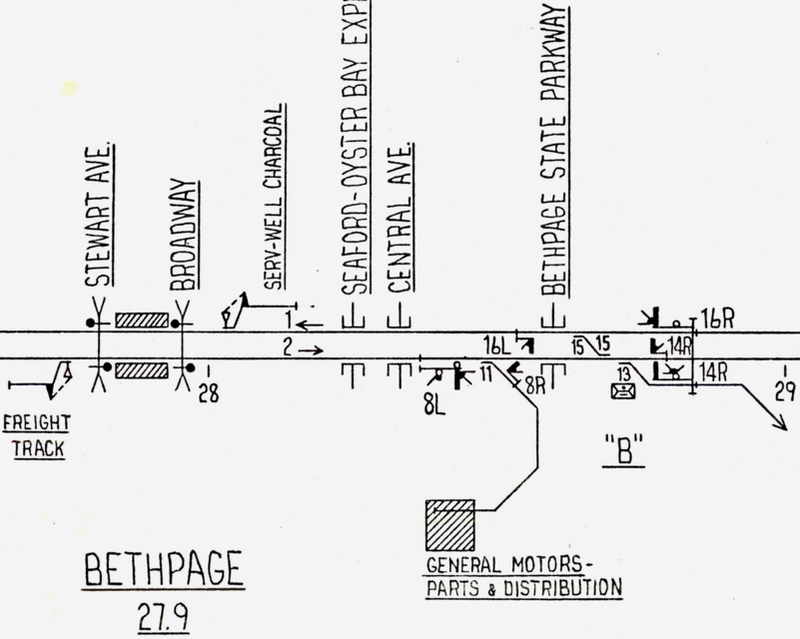 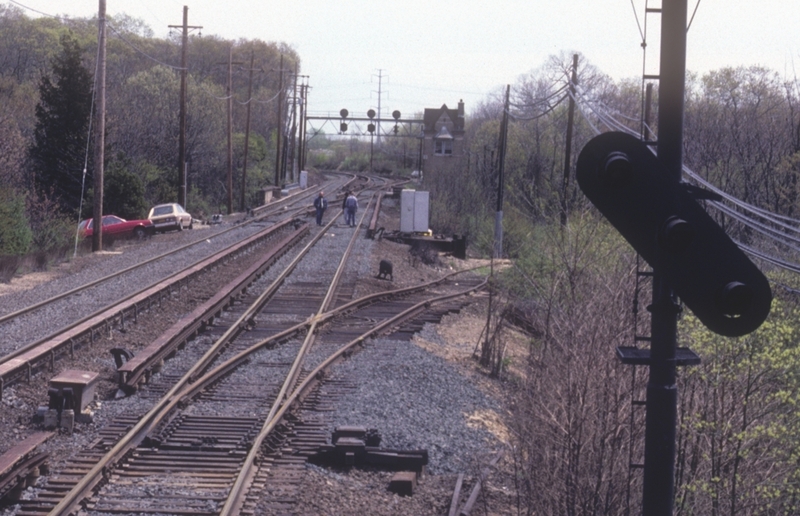 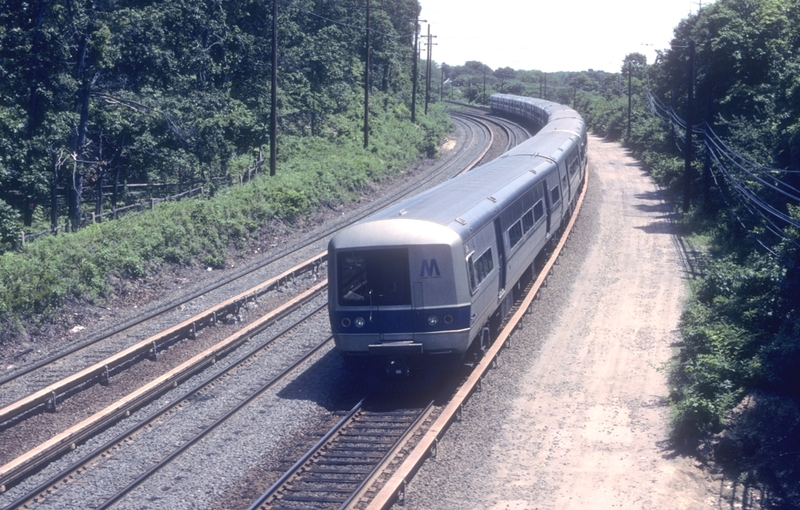 JUNE 16, 1987 - BETHPAGE TRAIN ON CENTRAL BRANCH CHANGING ENDS.